Traditional design bursting with modern comfort and panache. Deep diamond tufts travel the length of this superstar high back edge, imparting a graceful scalloped silhouette with a soft regal flair. Athens lasting luxury is impossible not to fall in love with. Its compact silhouette makes it a practical piece anywhere in your home. It's detailed with elegant nail heads enhancing the definition and lines. Styled with traditional roll-arms and a sheltering frame, the Athens style shows off its contemporary side with exquisite comfort you can curl up into. Universal functionality and luxurious design makes Athens incredibly attractive, and comfortable. 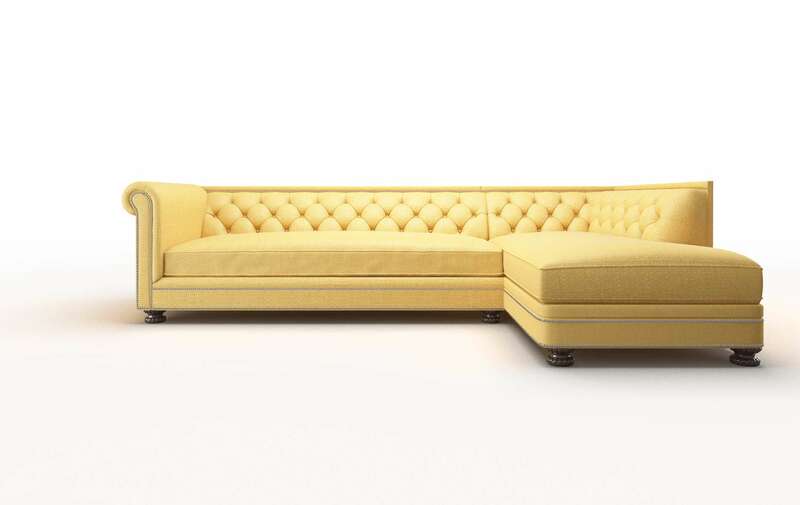 Dive into comfort with an inviting bench seat, and plush upholstered back cushion, accented with dazzling diamond tufting, to create the ultimate lounging experience. Every aspect of Athens can be customized until its simply perfect. Your style, your fabric, your fit, personalized your way. So dive in, play, design, and fall in love as you bring your dream design to life. Athens is customizable to any size, or configuration. Need to create a big comfy sectional, or reduce the length by 4 inches, no problem! Use our exciting SIZEiT ™ app to Find Your Perfect Fit.